James Doolittle was a former Army aviator who became the country’s leading civilian test pilot between the wars. He was recalled to active duty well before the attack on Pearl Harbor and helped organize the expansion of the Air Corps. 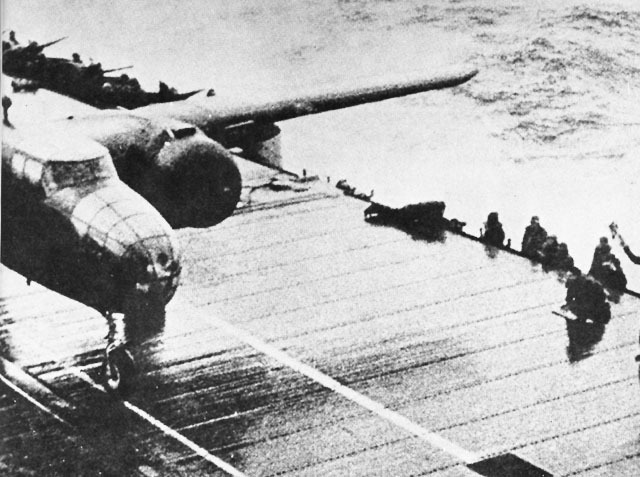 In April 1942, Doolittle was ordered to plan a carrier raid on Tokyo. Because of the weakness of the U.S. Navy at this point in the war, and the anticipated strong defenses of the Japanese homeland, the raid was conducted by medium land-based bombers whose crews were specially trained at carrier takeoffs. Because landing back at the carrier was out of the question, the bombers were to proceed to China and reinforce the Nationalist air forces. The directive to launch a raid on Japan originated with Roosevelt, but the unlikely source for the idea of having land-based aircraft attack from a carrier was a submarine officer on King's staff. King passed the suggestion on to Arnold, who had Doolittle perform a feasibility study that identified the B-25 as the only bomber in the American inventory capable of taking off from a carrier, attacking Tokyo, and flying on to friendly bases in China. Doolittle selected and trained a group of 24 volunteer crews from 17 Bombardment Group, which had been flying B-24s longer than any other formation in the Army Air Forces. The crews were trained in great secrecy at Eglin Field, Florida, where a naval aviator, Lieutenant Henry F. Miller, provided instruction in very short takeoffs. The crews were also trained in low-level flying and night navigation. They were to approach their targets at low altitude, then climb to 1500' (460m) for their bomb runs. Their aircraft were specially modified for increased range, including the installation of additional fuel tanks in place of the ventral gun turret, and their Norden bombsights were removed. The crews were trained to use a simple "Mark Twain" bombsight in place of the Norden, which was considered too sensitive to use on a raid where there was a high probability of the Japanese recovering a crashed American aircraft. The crews and sixteen of the aircraft embarked on the Hornet at Alameda and sortied for Japan on 2 April 1942. The Hornet task force was joined en route by Halsey’s task force built around the Enterprise, which would provide fighter cover. The original plan called for a takeoff from 450 miles out timed so that the bombers would arrive over the target after dark. However, as early as 10 April, the Japanese had hints from traffic analysis that an American carrier force might be headed for Japan. The task force was spotted by Japanese picket boat Nitto Maru #23 at 0738 on 18 April 1942, while still 800 miles from Japan. The picket boat was promptly sunk by gunfire, but not before it was able to transmit a warning to Tokyo. Halsey ordered Doolittle to launch at once rather than further risk half the Navy’s carrier strength, and Doolittle's aircraft took to the air at 0818. As a result of the early launch, the raiders arrived in daylight, but the Japanese defenses were taken by surprise and Doolittle's fliers made their bombing runs unscathed. The Japanese had received the picket boat warning, but assumed that the Americans planned a raid with conventional carrier aircraft, and calculated that the raid could not be launched until the next day. The main Japanese carrier strike force had just completed a raid into the Indian Ocean, far to the west, and was unable to intercept the Hornet task force, which made a clean escape. The material damage done by the raid was relatively minor. The raiders each carried three 500 lb (227 kg) demolition bombs and an incendiary cluster, and these were targeted on oil stores, factories, and military establishments. One bomb hit the carrier Ryuho, which was undergoing reconstruction at Yokosuka Navy Yard, delaying its completion by some months. The other damage was quickly repaired. Some of the bombs went wide of their targets and hit heavily populated neighborhoods, which provided a pretext for the later mistreatment of captured raiders. Because of the early takeoff, none of the raiders made it to friendly Chinese airfields. One plane, which suffered a carburetor malfunction, landed at Vladivostok where the crew were interned by the Russians. Although a favorable tail wind allowed the other fifteen aircraft to reach the China coast, miserable weather and night conditions prevented any of them from landing at the Chinese airfields. The aircraft crash-landed or their crews bailed out after their aircraft ran out of fuel. Three raiders were killed bailing out or in crash landings. Another eight raiders fell into Japanese hands. The remainder were spirited out to Chungking and, eventually, back to the United States. The Japanese were outraged by the attack, which caused the military great loss of face. Sugiyama Gen felt particularly humiliated, and persuaded Tojo to pass retroactive regulations subjecting captured bomber crews to the death penalty. The eight raiders captured by the Japanese were accused of strafing civilians and were treated as war criminals, three being executed by firing squad and another dying in captivity. The raid also muted most of the opposition to Yamamoto’s Midway operation, though the decision to proceed with the operation had already been made and the plan presented to the Emperor two days earlier. This ill-conceived operation would prove disastrous for the Japanese. The Doolittle raid was a tremendous morale booster for the Allied public at a time when good news was very scarce. If the measure of success of a military action is its political results, then the Doolittle raid must be regarded as a resounding military success, notwithstanding its negligible material impact. The most concrete military effect of the raid was that the Japanese retained four fighter groups in Japan in 1942-1943 that were badly needed elsewhere. The East China Campaign. Chiang Kai-shek had only reluctantly agreed to the raid, fearing the likely Japanese reaction. He was also told few details of the plan, since the Americans did not trust Chinese operational security (for example, the Americans knew from ULTRA that the Japanese were reading Chinese codes.) Chiang did not give his consent for the raiders to land on Chinese airfields until 28 March, and it was not until 2 April that he was told the approximate number of aircraft involved and the airfields they would be landing at. Chiang's fears were well-founded. In retaliation for Chinese involvement in the Doolittle Raid, and possibly because they mistakenly believed that the raid had been launched from China (Peattie et al. 20111), the Japanese Army went on a rampage in China, killing an estimated quarter of a million Chinese civilians. 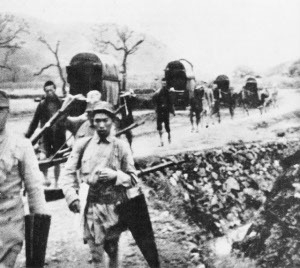 Some 140,000 Japanese troops from five divisions and three independent mixed brigades of 13 Army participated in a sweep of airfields in Chekiang and Kiangsi provinces in mid-May 1942 and also stripped the Chekiang-Kiangsi rail line of rolling stock. After linking up with two divisions from 11 Army at Nanchang, the Japanese pulled out of the area. Chinese military casualties were estimated at 40,000, while the Japanese suffered 1600 dead and 28,000 wounded.